The Quik Drive® BSD200 Structural Steel-Decking system and the Quik Drive PROSDX150 Steel-Decking system are the only tools you need to fasten steel decking. The BSD200 is the perfect choice for fastening wide-valley nestable steel deck to structural steel members where the maximum load values of the Strong-Drive® XL Large-Head Metal screw are required. The PROSDX150 is the multipurpose system for nestable or interlocking steel decking and side-lap stitching. 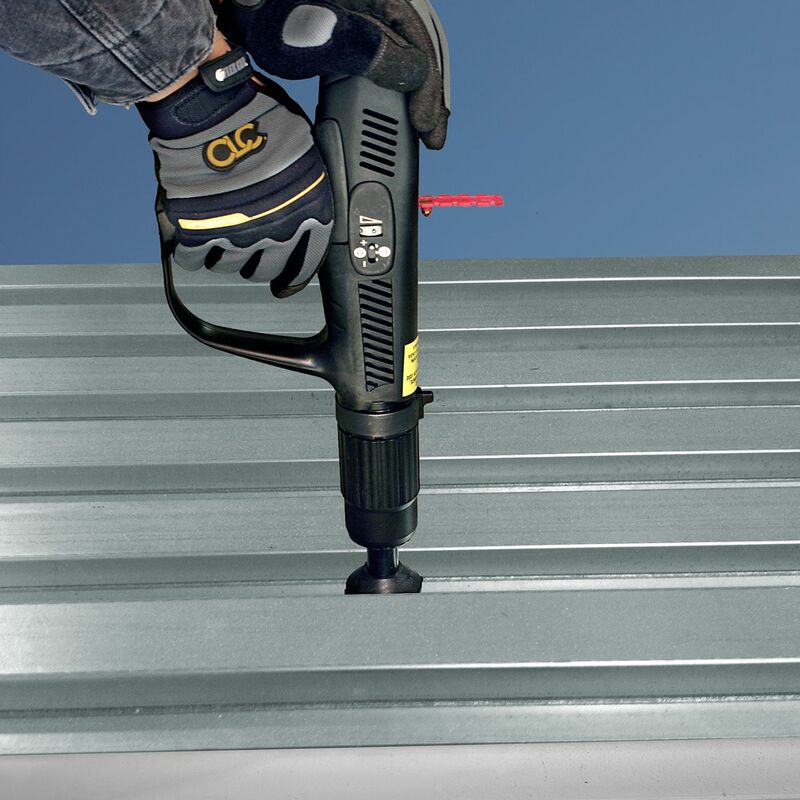 The PROSDX150 can be loaded with the Strong-Drive XM Medium-Head Metal screw for interlocking steel deck applications, or one of the Strong-Drive Self-Drilling X Metal screws for side-lap stitching or coldformed steel framing. Why use screws instead of welding? Consistent screw installation streamlines the inspection process with no special inspections. Save time and money with painted decks; no need to repaint or touch up from welding. Reduce costs by eliminating the need for welding leads, welding rod, portable welders, fuel and certified welders. No deck burn-through around the weld perimeter. Why use screws instead of pins? No under-driven pins at 4-layer deck corners. 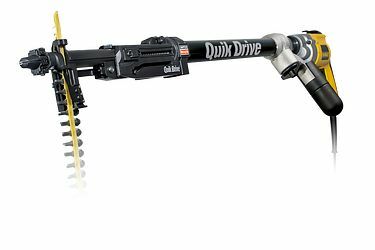 No special licensing or certifications are required to operate the Quik Drive auto-feed system, as are required with PAF solutions. 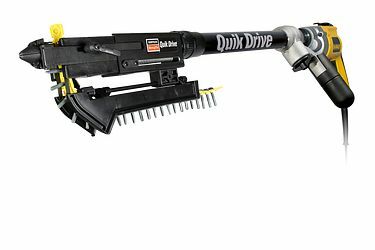 Unlike daily PAT maintenance, Quik Drive systems do not require periodic cleaning. No need to cordon off below the active decking site. Quik Drive eliminates the ballistic safety hazard associated with PAF. Screws indicate when you missed the joist by not seating. No powder loads; track only one consumable — fasteners. Lifetime warranty on the Quik Drive system. The Quik Drive BSD200 is an auto-feed screw driving system designed for structural steel decking applications. It is the perfect choice for fastening wide-valley nestable steel deck to structural steel members where the maximum load values of the Strong-Drive XL Large-Head Metal screw are required. The PROSDX150 is the multipurpose system for nestable or interlocking steel decking and side-lap stitching. 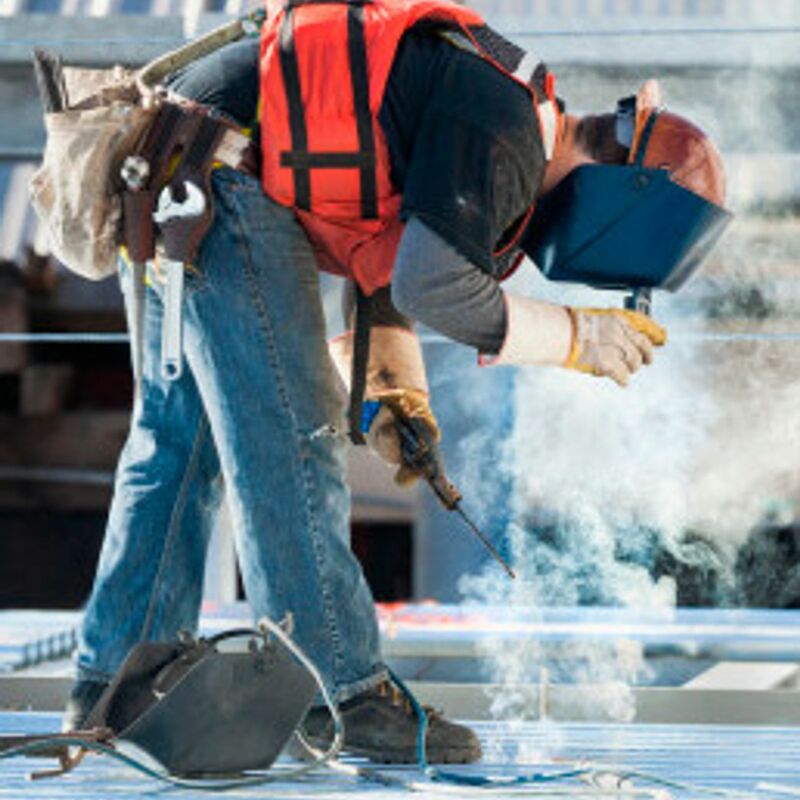 The PROSDX150 can be loaded with the Strong-Drive XM Medium-Head Metal screw for interlocking steel deck applications, or one of the Self-Drilling X Metal screws for side-lap stitching or cold-formed steel framing. Strong-Drive metal screws are load-tested and code-listed, allowing you to get the maximum load values for installation. Strong-Drive XL Large-Head Metal screws are the perfect choice when high shear or uplift resistance is required. Strong-Drive XM Medium-Head Metal screws, with their 1/2" washer head, are designed for narrow flutes commonly found on interlocking deck profiles. In high-strength decks (Fy= 50 ksi), these screws are excellent 1-for-1 replacements for pins. These screws can be used with Verco PunchLok II system or with ASC DeltaGrip system sidelap connections. The Strong-Drive Self-Drilling X Metal screw is your go-to screw for lighter-duty support fastening and stitching applications. These screws are available in bulk or collated for Quik Drive steel-decking systems. Simpson Strong-Tie provides a full offering of code-listed fasteners for your next steel-decking job. Comparison testing shows that Strong-Drive XL Large-Head Metal screws and Strong-Drive XM Medium-Head Metal screws are stronger than many alternative fastener types in 33 ksi and 50 ksi steel decking. Save and upload input files. Design for multiple zones and develop solutions in either ASD or LRFD. Modify deck properties from the standard properties listed in SDI DDM03. Generate multiple cost- and labor-optimized solutions with calculations included. Generate tables in Nominal, ASD Wind, LRFD Wind, ASD Seismic or LRFD Seismic. Wind tables can include effects of upllift. Design for loads using the Strong-Drive XL Large-Head Metal screw, Strong-Drive XM Medium-Head Metal screw or Strong-Drive Self-Drilling X Metal screw (included in the optimization calculator). Design for additional structural patterns not covered in SDI DDM03. Access proprietary deck tables with the new Strong-Drive XM Medium-Head Metal screw. Load tables are available on our website application for using Strong-Drive XM Medium-Head Metal screws on frequently used interlocking decks with their proprietary side-lap connections. 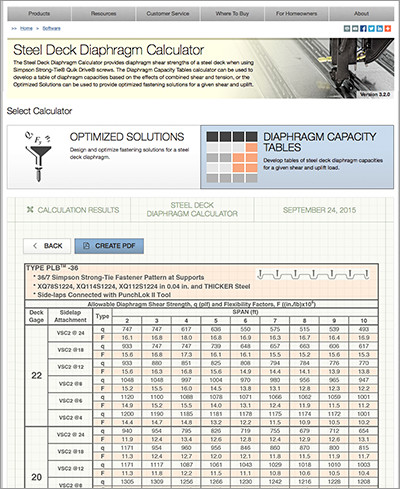 For more information regarding Strong-Drive XM Medium-Head Metal screw shear tables, refer to the Steel-Deck Diaphragm Calculator.